Pythagoras was born on the Greek island of Samos and lived around the year 500 B.C. He visited Egypt and – it is assumed – Babylon. He founded a school on Samos and after the Persian occupation he settled in Crotone, South-Italy where he also founded the school for Pythagoreans. Pythagoras was a central figure in the transitional period between Antiquity and the Classical Period. In the world of the Antiquity, the gods play a central part in everyday life; there is a strong attachment to the physical world, to birth and decay, life and death. In the Classical world view, the gods (or god) are felt to have a personal, moral involvement with mankind. Divinity can be found within the soul. Natural phenomena are explained through the notion of causality. Our current view of the world is based on this Classical worldview itself a product of the philosophies of Pythagoras and other pre-Socratic thinkers, and still the source of many modern developments. This underlines the importance of reading and interpreting the original sources in their appropriate contexts. These ancient texts should not be read as prose or poetry; they should be read with the Pythagorean world view in mind. The Pythagorean moral philosophy is related to Orphic mysticism. It is difficult to distinguish which elements can be ascribed to the Orphics and which to the Pythagoreans. Central to this ethical philosophy was the concept of metempsychosis; the transmigration of the soul. Here we find a certain similarity to Hinduism. Belief in metempsychosis also entailed abstinence from animal products. The Pythagorean ethics are set out in the Golden Verses. These verses outline a way of life that leads to deity of the soul, and were probably written by one of Pythagoras’ followers. The Golden Verses were first put into practice in the Pythagorean Brotherhood in the south of Italy and later in the Pythagorean communities. and the spirits of the dead by performing the prescribed rites. Honor your parents as well as their closest relatives. for as long as you are able to do so. For ability lives near necessity. nor on your own. Feel shame before yourself most of all. and that property is wont to be acquired now, tomorrow lost. whatever lot you have, bear it and do not be angry. Many words assail human beings, bad as well as good. to do or to say whatever is not best for you. Deliberate before the deed, lest foolish things result from it. It is typical of a worthless man indeed to do or to say senseless things. But bring that to completion which will not distress you afterwards. what is necessary, and thus you will lead a most enjoyable life. exercises. By due measure I mean that which will not distress you. and guard against doing the kind of thing that incurs envy. nor be tight-fisted. Due measure is in everything the best. Do that which will not harm you, and take thought before the deed. have achieved good things, be glad. fount of ever-flowing nature. But to work! and pray to the gods to grant the fulfillment. how it pervades each thing and how each thing is ruled [by it]. nor do they hear it. Few understand the deliverance from their troubles. they are borne hither and thither, suffering endless miseries. if you would show all what kind of daimon they have. to whom Nature displays and shows each sacred object. and you will save your soul from these sufferings. by putting the excellent faculty of judgment in control as charioteer. you will be immortal, an undying god, no longer mortal. The Pythagoreans led ascetic lives. Respect for life was essential; vegetarianism was the norm and the sacrifice of animals to the gods was abolished. Pythagoras can thus be regarded as the founder of vegetarianism in Europe. Until the second half of the 19th century anyone who abstained from eating meat and animal products was known as a Pythagorean; it was only later that the word vegetarian was introduced. Vegetarianism became more or less synonymous with the Pythagorean way of life, although the former encompassed much more than a meat-free diet. The Pythagoreans also made great contributions to the field of astronomy. They assumed the earth was spherical, both on the basis of observation as well as the fact that it was – in their view – the ultimate shape, and fitted best in their system. By comparing the distances between the respective planets and whole and half musical notes, Pythagoras developed his theory of the Harmony of the Spheres. The cosmic scale has a distinctive root note, which we never hear although it is always there. It is said that Pythagoras himself could hear it. 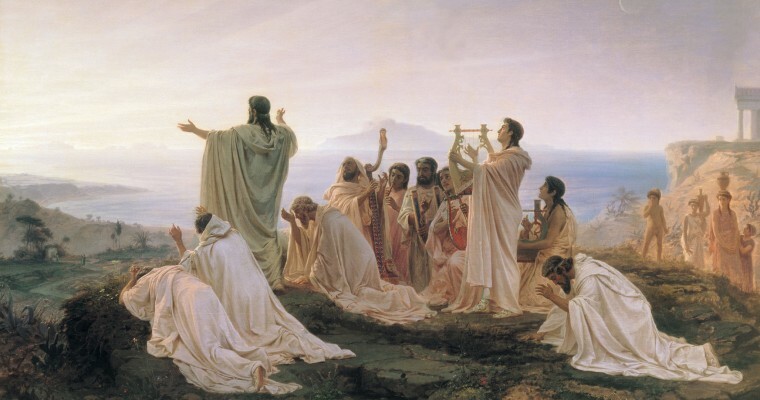 The Pythagoreans were highly active in the field of music. It was they who discovered the existence of a ratio between pitch and the length of a string on a sounding board. This led to an understanding of quantitative proportions. The Pythagoreans were so impressed by the significance of numbers and their relative proportions (harmony) that they declared the number to be the base of all existence, the essence of all things. The well-known triangle theorem that was named after Pythagoras was already known well before his time. The Pythagorean Ecphantus discovered that the earth rotates around its own axis. In the years following this discovery, it was still widely assumed that the planets moved around the sun. Aristarchus of Samos (280 B.C.) was the first to place the sun in the centre, with the earth and the planets revolving around it. It took until the 15 / 16th century for Copernicus to pick up where he left off.